Palazzo Corpi | The Hollings Center for International Dialogue | The Hollings Center for International Dialogue is a non-profit, non-governmental organization dedicated to fostering dialogue between the United States and countries with predominantly Muslim populations in the Middle East, North Africa, South Asia, Eurasia and Europe. The Palazzo Corpi is one of the oldest U.S. government-owned diplomatic premises in the world. First built in 1830 by Genoese merchant Ignazio Corpi, American ambassador John G.A. Leishman rented the building for use as the U.S. legation and residence in 1882. Centrally located in the Beyoğlu neighborhood (formerly Pera), the Palazzo Corpi is a clear architectural gem. Its classical façade features an American eagle and crest. The interior is decorated with frescoes of mythological scenes, marble flooring and etched glasswork. In 1907, Ambassador Leishman used his personal funds to purchase the property for 28,000 Ottoman liras, having decided that the US should own rather than lease the building. Leishman anticipated reimbursement from the U.S. government upon a return trip to Washington and was surprised to find that Congress had no plans for this repayment. Rather than accepting the personal expenditure, Leishman hosted several members of Congress to a party, inviting them to drink and play poker late into the night. Ambassador Leishman challenged the Congress members to a poker game over the status of the Palazzo and won, resulting in Congress repaying Leishman for the Palazzo and granting it two unique titles: the first diplomatic building purchased by the U.S. government and the only such building acquired through a card game. The Palazzo served as the U.S. embassy and residence from 1906 and then as the consulate general from 1937 until 2003, after the designation of Ankara as Turkey’s capital in 1923 resulted in the transfer of embassy activities away from Istanbul. Throughout this history, the Palazzo Corpi served as a symbol of U.S. public diplomacy in the region. In 2003, the U.S. State Department moved the Consul General to a more modern facility on the European shore of the Bosphorous. Many of the diplomats and officials who had worked at the Palazzo Corpi were determined to preserve the building’s history and significance to American foreign policy. Congress created the Hollings Center in 2004 to fill this role, designating the Center to host programs that will reinforce communication and understanding between the US and the Muslim world. To best preserve the history and structure of the Palazzo Corpi, the U.S. State Department negotiated on the Hollings Center’s behalf for a Turkish holding company to spearhead renovations and restoration. This process was completed in early 2015, when the Palazzo Corpi reopened as a hotel and conference center. Featured in this new space is the Hollings Center’s Istanbul presence, allowing for the continuation of the Palazzo Corpi’s historic tradition of promoting dialogue and fostering cross-cultural cooperation. 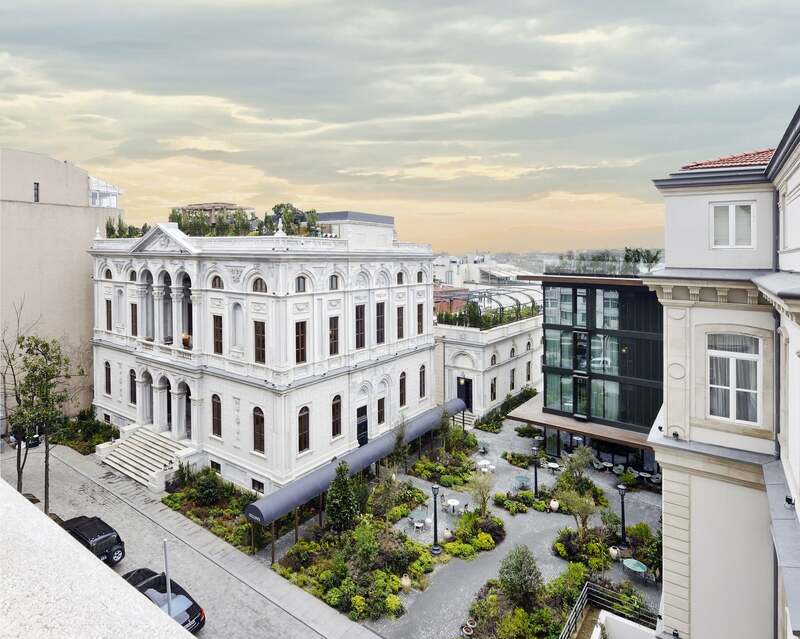 The Palazzo Corpi, newly reopened as the Soho House Istanbul. Image courtesy of Soho House.